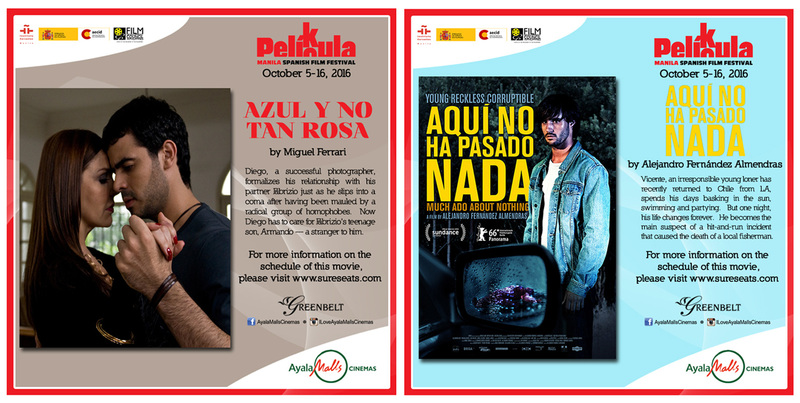 The much-awaited yearly Spanish Film Festival, now on its 15th year, showcases the best of contemporary Spanish and Latin American films exclusive at Ayala Malls Cinemas’ Greenbelt 3 from October 5 to 16. 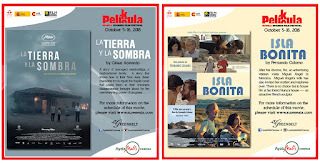 Twenty (20) films will be featured in this year’s edition coming from countries such as Spain, Colombia, Argentina, Chile and Venezuela. 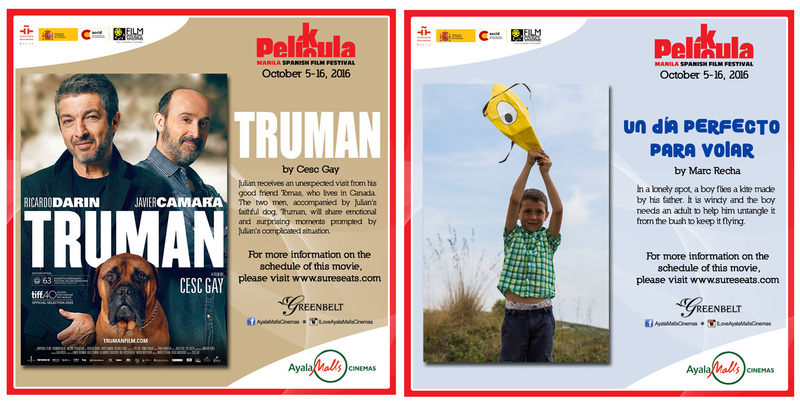 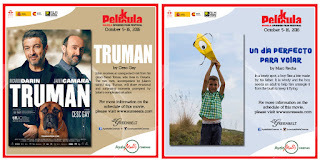 The festival will kick off on October 5 with the screening of “Truman”, a bitter comedy directed by a notable Spanish film maker Cesc Gay which garnered best film, best director, best original screenplay, best actor and supporting actor in the 2016 30th Goya Awards. 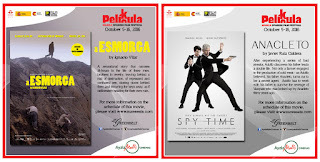 It also raked other awards from International award giving body. 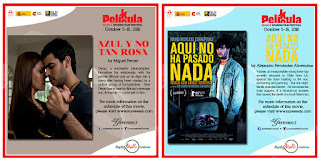 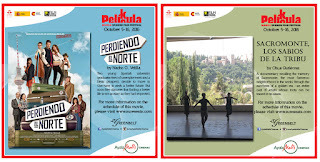 Among the films of the are “Perdiendo el Norte”, “Techo y comida (Food and Shelter)”, “Much Ado about Nothing”, “Azul y no tan rosa (My Straight Son)”, “Anacleto (Spy Time)”, “A Esmorga”, “Cien años de perdón”, “The Clan”, “My Big Night”, “Isla Bonita”, “El Rayo”, “Palm Trees in the Snow”, “Sidetracked”, “La Tropa de Trapo”, “Embrace of the Serpent”, “A Perfect Day to Fly”, “Land and Shade”, “Sacromonte”, “Los Sabios de la Tribu” and “B, la película”. 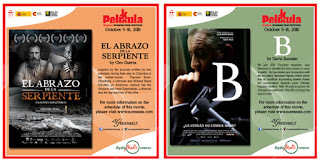 Instituto Cervantes and Embassy of Spain have collaborated with Embassy of Colombia and will feature La Noche del Cine Colombiano, first time in the long running Spanish Film Festival. 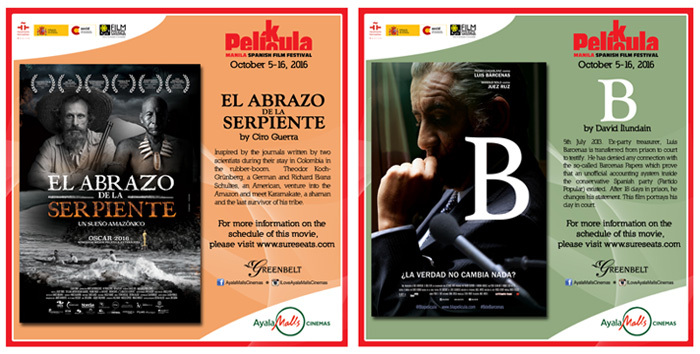 The Colombian Night will put on the spotlight on two of its best films: El Abrazo de la Serpiente (Embrace of the Serpent) and La Tierra y la Sombra (Land and Shade) on October 10. 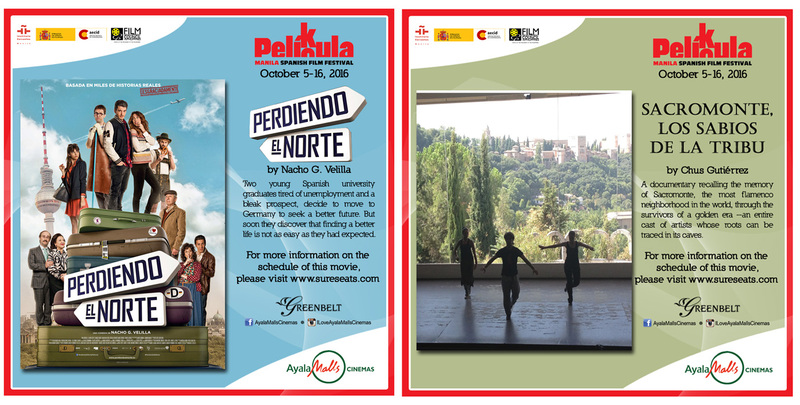 Get a movie treat by following the Ayala Malls Cinemas Instagram page (@iloveAyalaMallsCinemas) and regram our Pelicula Spanish Film Fest posts with the hash tags #PeliculaAyalaMallsCinemas #iloveAyalaMallsCinemas to win free tickets to La Noche del Cine Colombiano on October 10. 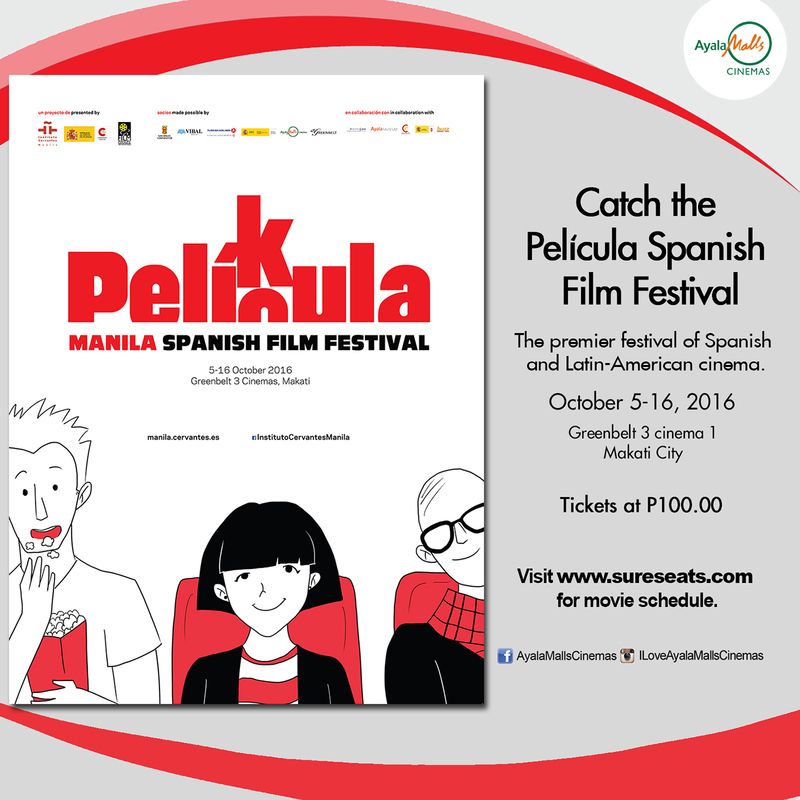 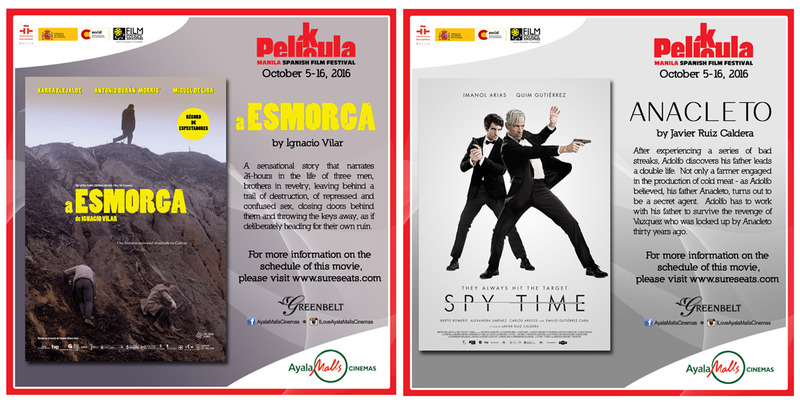 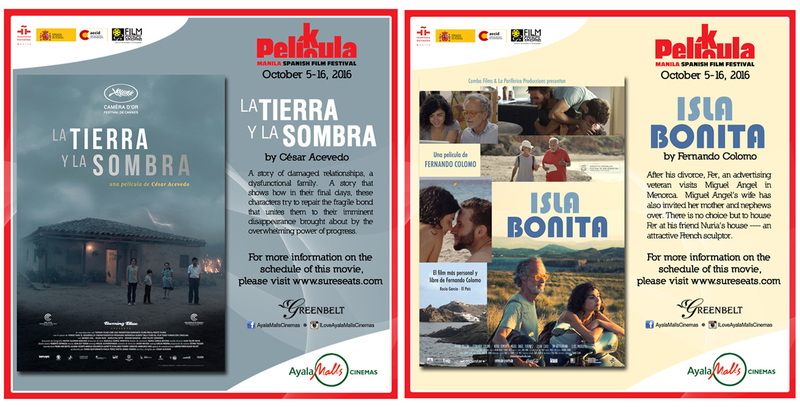 Watch all entries of the Spanish Film Festival at Greenbelt 3 for only P100 per film, and get a chance to win a round-trip ticket to Spain. 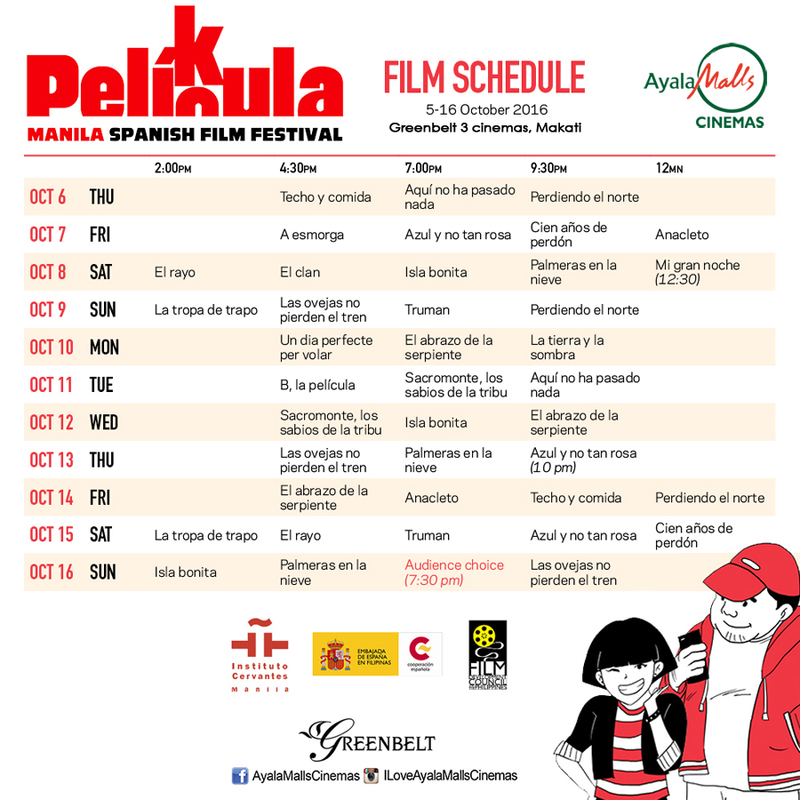 Tickets can be purchased at www.sureseats.com or at the Greenbelt 3 cinemas ticket booth.